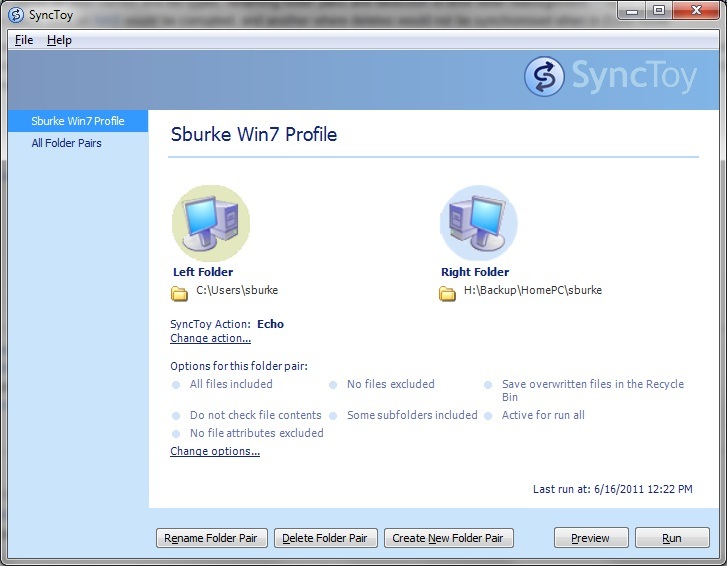 Synchronize: New and updated files are copied both ways. Renames and deletes in one folder is repeated on the other. Echo: New and updated files are copied left to right. Renames and deletes on the left are repeated on the right. Subscribe: Updated files on the right are copied to the left is the file name already exists on the left. Contribute: New and updated files are copied left to right. Renames on the left are repeated on the right. Similar to Echo, except there are no deletions. Combine: New and updated files are copied both ways. Renamed and deleted files are ignored. I’ve been using SyncToy for doing some occassional backups on a Windows pc. It just works. This entry was posted in IT and tagged backup, computers, disk, Software, windows, windows 7. Bookmark the permalink.